This is the setup I run for powering my auxiliary reverse lights. If you choose to run them off your existing backup light line but don't always want them to come on when you hit reverse or if you want to be able to have them on full time the diagram on the left is the one you want. 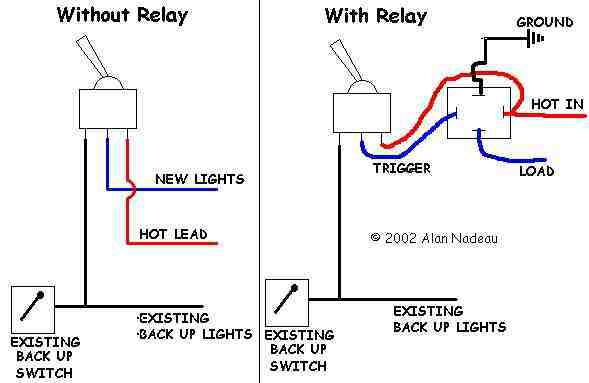 If you want to use a relay to switch the heavy current for the lights use the diagram on the right. Either way you need a single pole, double throw (SPDT) switch with center off. That gives you three options, constantly on, never on, or on with your factory lights. The relay diagram is how I do it. That way the reverse light switch is never carrying the heavy load of the extra lights. I found out the hard way that the stock switch may do fine with only two 1156 bulbs but adding 70 watts of load shortens the life of it a lot. Be sure to fuse the power lead. The "tractor" lights are 35 watt, two of them will need a 10 amp fuse. 50 watt halogens will need 15 amps and 100 watt halogens will have to have a 20 amp fuse in the line.